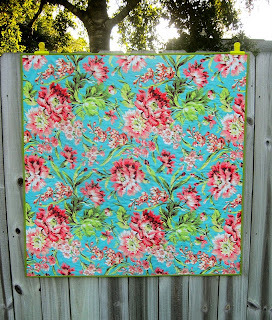 This quilt is otherwise known as, "If I were a quilt I would look like..." Sometimes quilts come together so easily, it's like they make themselves. 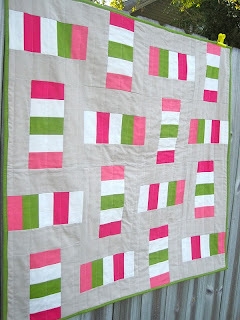 I started this quilt at 8 last night and finished it at 1130. I love it! It came out exactly like I wanted--don't you love it when that happens? The entire front and binding are made from Essex linen/cotton blend in various colors. The neutral background color is sand, but I'm not sure of the names of the rest. 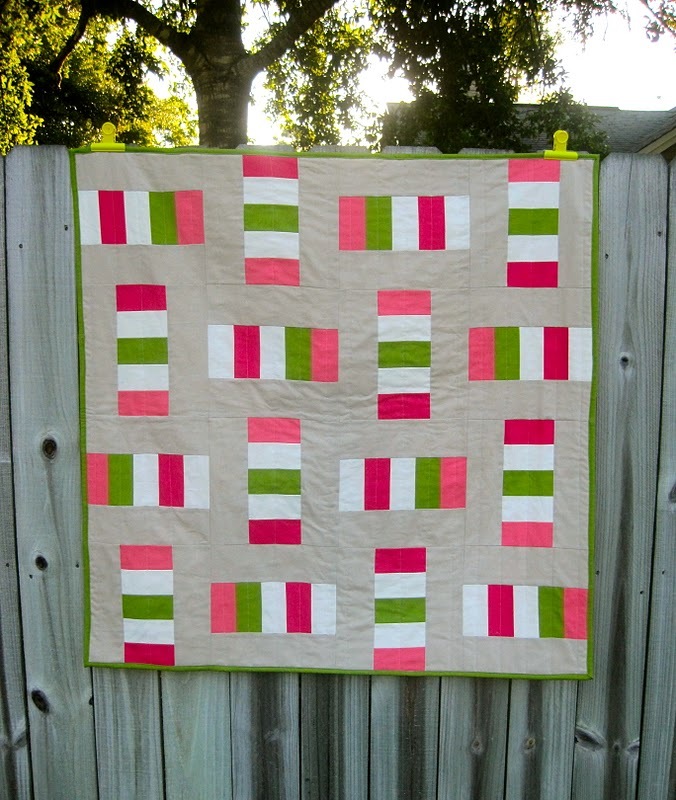 I cut (2) 2.5" x WOF strips of the coral, pink, and green fabric; (4) 2.5" x WOF strips of the ivory, (32) 3.5"x 10.5" rectangles of the Sand background. I sewed 5 of the strips together then cut (8) 4.5"x10.5" rectangles from those. I repeated this step with the remaining 5 strips, but I alternated the order. Then, I sewed a 3.5"x10.5" background rectangle to either side of the pieced strip. When piecing the top I simply alternated directions of the block (and alternated style of pieced block). Ta-da! 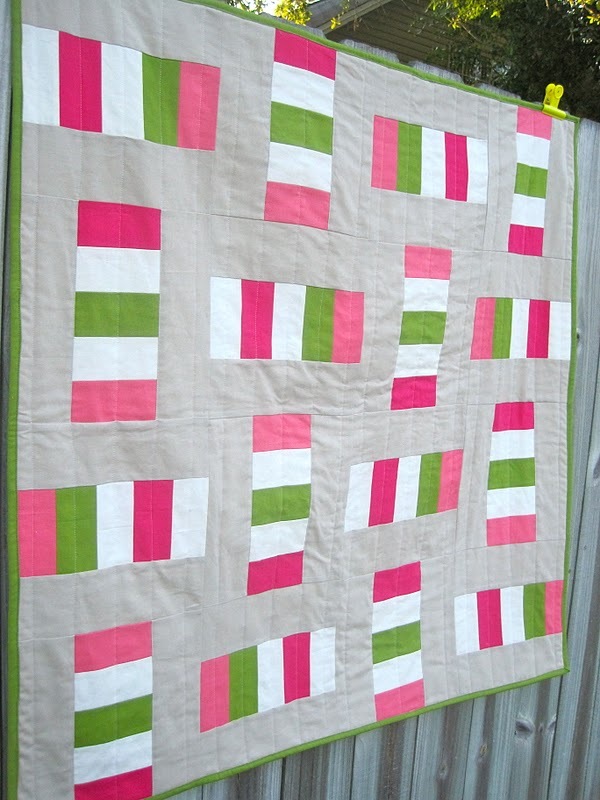 A cute, modern 40"x40" baby quilt! This is genius! Thanks for sharing how you did it. And that back is perfect! I love it! Great backing, too. I like that it is a little girly without being overkill. Sounds like you are going to have an awesome space at this bazaar with all the things you've been making! This is so cute! I think you need to make yourself a mini. Oh I love it, and the Amy Butler print is such a wonderful surprise on the back - well done. Another couple before dinner?